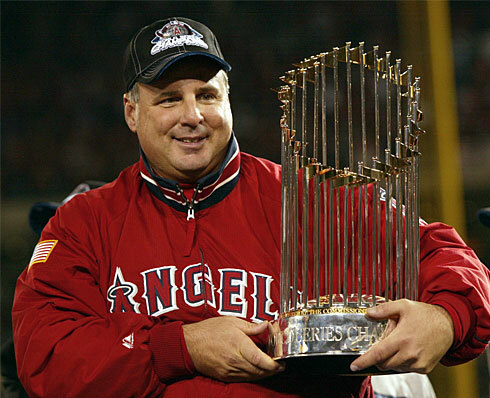 Michael Lorri Scioscia was born on November 27, 1958 in Upper Darby, Pennsylvania. He went to high school in the Italian American neighborhood outside of Philadelphia where Tommy Lasorda had grown up. 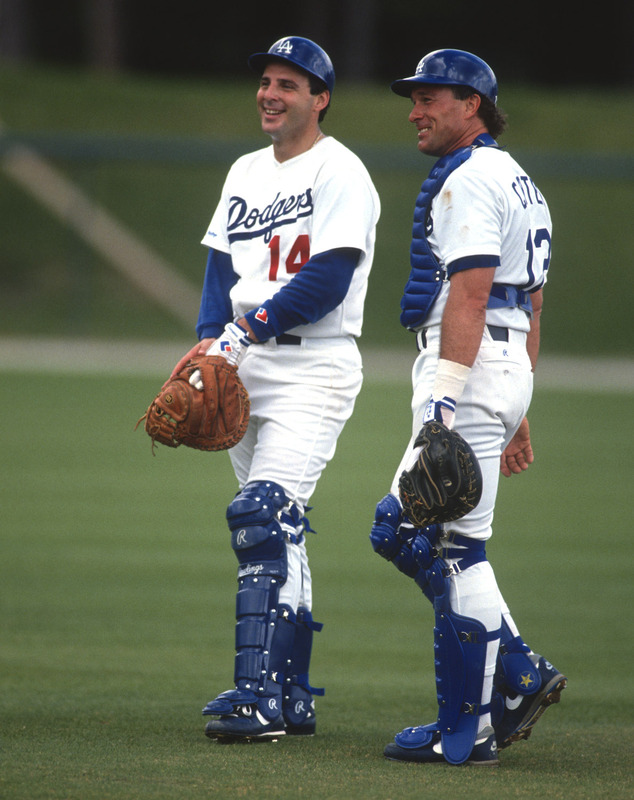 Lasorda was certainly involved in helping to recruit the young catcher. In 1976 he was signed by the Los Angeles Dodgers as a first round draft pick (19th overall). The six foot two, two hundred pound cather batted left handed but threw right handed. After five minor league seasons, he made the Dodgers big league team by 1980. 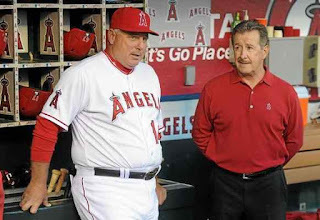 Scioscia made his MLB debut on April 20th 1980 in the 11th game of the season. He would play in 54 games that year & in the Dodgers 1981 Championship season, he took over as the main catcher replacing veteran Steve Yeagar. Quotes: Tommy Lasorda was quoted as saying: When I made Mike the No. 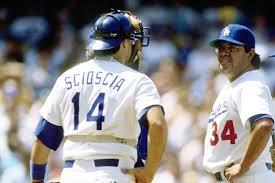 1 catcher, the writers came to me and said, Yeager said you made Scioscia the No. 1 catcher because he's Italian." I said, "That's a lie. I made him the No. 1 catcher because I'm Italian." By 1981 Fernando Valenzuela had come on the scene causing "Fernandomania" in Southern California. Scioscia went out & learned Spanish so he could communicate better with the new rookie sensation pitcher. The 1981 Dodgers consisting of the new guys; Scioscia, Valenzuela, & Pedro Guerrero as well as the old long time Dodger core veterans, Steve Garvey, Ron Cey, Dave Lopes, & Bill Russell went on to win a long awaited Championship for Los Angeles, in that strike shortened season. In 93 games he hit .276 with 2 HRs & 29 RBIs. 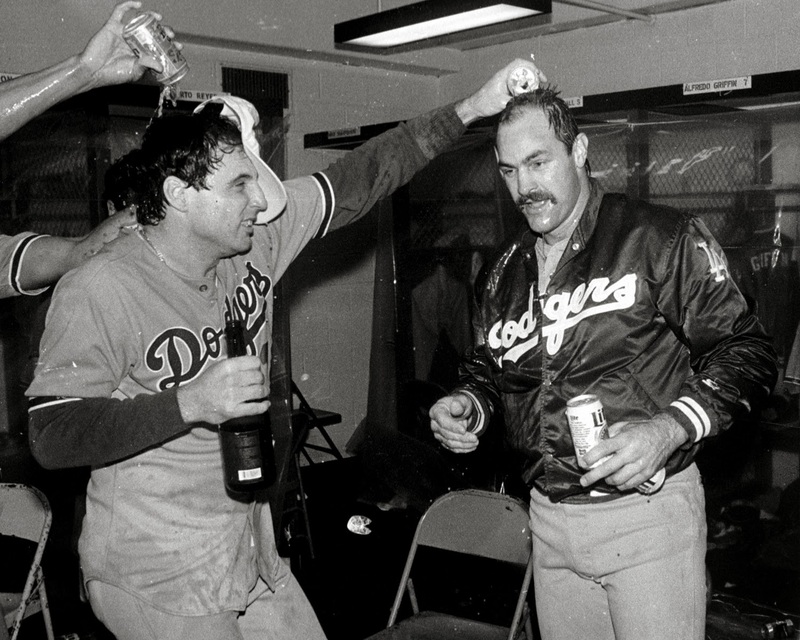 Post Season: In the 1981 NLCS he hit a HR off Montreal’s Jeff Reardon in Game #1 helping the Dodgers to a 5-1 win. He hit .250 in the World Series playing in only three of the six games. In the post season overall he was he went 5-32 with two RBIs. Although he was a decent hitter, Mike Scioscia was known for his great defense, and his incredible ability to block home plate. 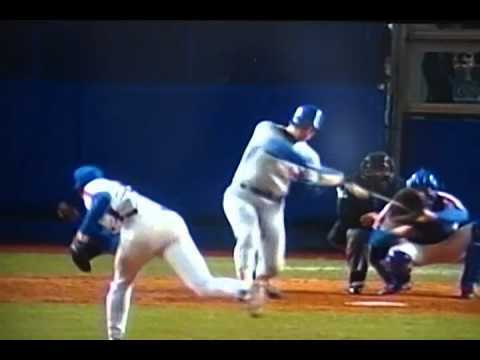 When blocking the plate he would be positioned on an angle down on both knees while making the tag with the ball in his catcher's glove, different from the most catchers style. 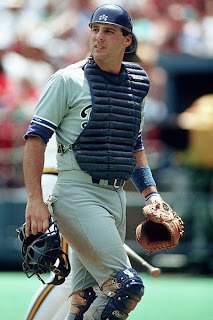 He was also known for his durability, after tearing his rotator cuff in 1983, he would catch over 100 games for the Dodgers in each of the next ten seasons. In 1985 he was knocked unconscious by the Giants Will Clark but still held onto the ball for the out. The next year he & the Giants Chili Davis were both knocked out cold, in another brutal home plate collision. That was the one Scioscia called the worst of his career. He led the league in throwing out base runners caught stealing twice, (1988-1989). He would throw out over 40% of would be base stealers twice in his career with over 35% seven times. He led all catchers in put outs three times, assists & passed balls twice each. He also caught two no hitters in his career one from Fernando Valenzuela in 1990 & another thrown by Kevin Gross in 1992. 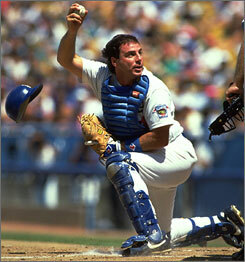 Scioscia went to two All Star Games, becoming the first Dodger catcher to start an All Star Game (1990) since Roy Campanella. He was a solid contact hitter, that did not strike out too much, averaging one strike out every 14 at bats during his career. In 1995 he batted a career best .296 with his second best average coming in 1981 when he hit .276. He was not much of a power hitter, hitting a career high 12 HRs in 1990. Post Season: Scioscia returned to the post season in 1985, batting .250 in a series loss to the St. Louis Cardinals. But it was the 1988 NLCS that Met fans always remember. In Game #4 the Mets were leading 4-2 in the 9th inning & had a 2-1 Series advantage. Mets ace Dwight Gooden was on the mound & John Shelby drew a walk. Mike Scioscia coming to bat as the tying run. He blasted a game tying HR, silencing & stunning the Shea Stadium crowd. It was a nightmare as the Mets of that era did not make another post season. The Mets did not get to the playoffs for another 11 years. The Dodgers would go on to win the game when Kirk Gibson hit his 12th inning HR off Roger McDowell. Although they took it to a Game seven, the Mets could never recover. A matter of fact it would be eleven years before they got to another post season. Scioscia hit .364 in that Series as his team advanced, going on to shock the Bash Brothers & the Oakland A’s in the World Series. After a 13 year career, the lifelong Dodger had to retire due to injuries taking their toll on him by the age of 34. He finished his career batting .259 with 68 HRs 198 doubles 446 RBIs & a .344 on base % with two World Series titles. Behind the plate he caught in 1395 games (39th most all time). He made 8335 put outs (23rd all time ) with 737 assists (89th all time). He threw out 500 base runners trying to steal (64th all time) 34%. Retirement: After his playing days he coached for the Dodgers organization until he was hired by the Los Angeles Angels f Anaheim as their manager during the 1999 season. 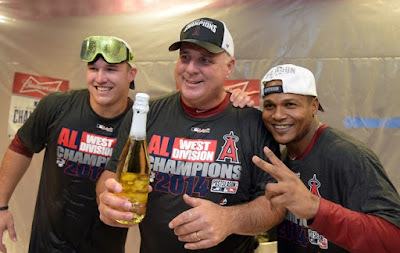 With Scioscia at the helm the Angels had their most successful period in their history, winning five AL West titles, & their first World Series title in 2002. Scioscia won the Manager of the Year Award that season becoming the 17th person to win a World Series as both Player & Manager. 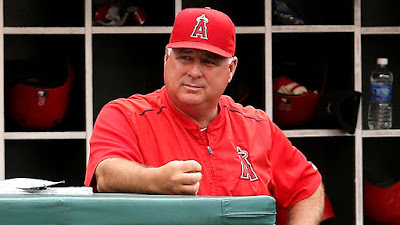 He is the first manager to reach the post season in six of his first ten seasons, and has become the Angels all time leader in victories. In 2009 he won another Manager of the Year Award & had his contract extended through 2018. In 2012 Angels GM Jerry DiPoto fired his hitting coach & friend Mickey Hatcher. Dipoto & Scoscia did not get among well as tensions mounted over the next two seasons until DiPoto resigned. In 2013 his team played under .500 but rebounded in 2014 as he came in second in the Manager of the Year Award. The Angels won 98 games (98-64) the third highest amount of wins in his career as manager. After winning the AL West his team was upset in a three game sweep by the Kansas City Royals. Although the Angels won 85 games in 2015 they finished third not making the post season. In 2016 Scioscia's team finished under .500 for just the fifth time in his 17 years as manager. He is the major league's longest tenured manager going into the 2017 season. 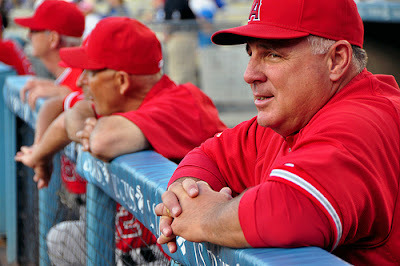 TV appearances: Scioscia has made two famous appearances on the Simpsons cartoon. He also is known in Southern California as a celebrity endorser for a Superstore Chain. Family: He met his wife Anne while she was bringing him cookies at Dodger Stadium. Together they have two children & live in Westlake Village, California. 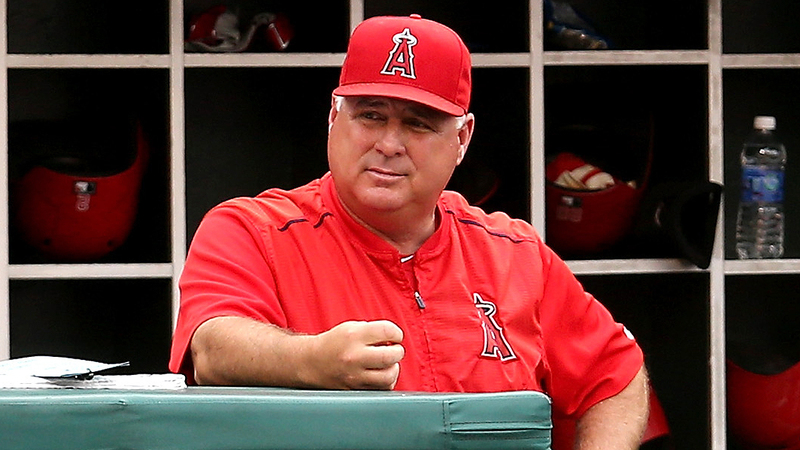 His son Matt Scioscia was drafted in the 45th round of the 2011 draft by the Angels. In 2014 he was traded to the Chicago Cubs organization for Trevor Gretzky son of Hockey legend; Wayne Gretzky.